*Almost a year ago, Michelle Obama made headlines (positive and negative) for baring her arms in a sleeveless Narciso Rodriguez dress during her husband’s speech to Congress. 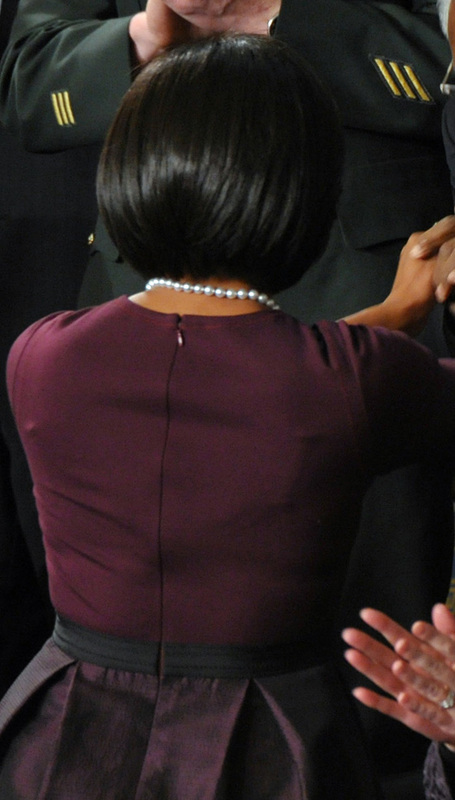 For President Obama’s first State of the Union dress last night, the First Lady wore a more conservative Isaac Mizrahi eggplant-colored ensemble (but not from his collection available at Target). The outfit had three-quarter-length sleeves and was finished by a simple strand of pearls. I like this dress. It looks very good on Michelle! This is one of the most attractive photos of the first lady; the photo of her asking for help in Haiti was not one of them….. I love that color and it looks great for her, though I ain’t too sure about the dress, I need a better full-length shot. I finally figured it out, she’s shaped like a bowling pin.